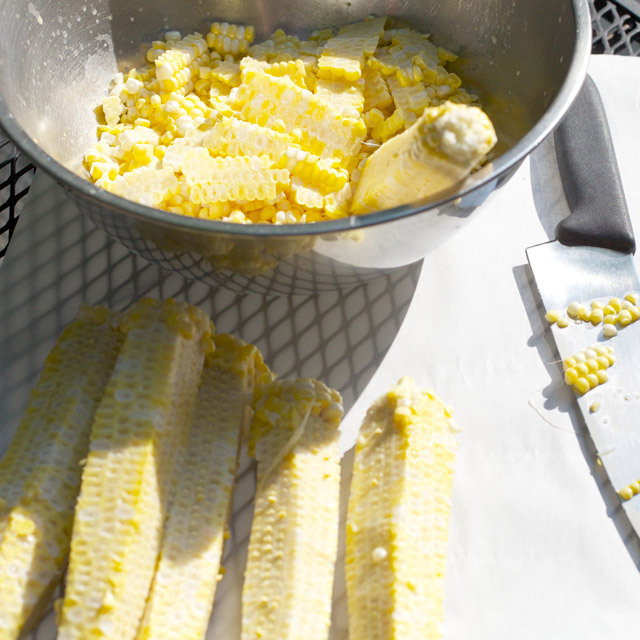 Sweet corn is one of the most glorious pillars of summer produce. 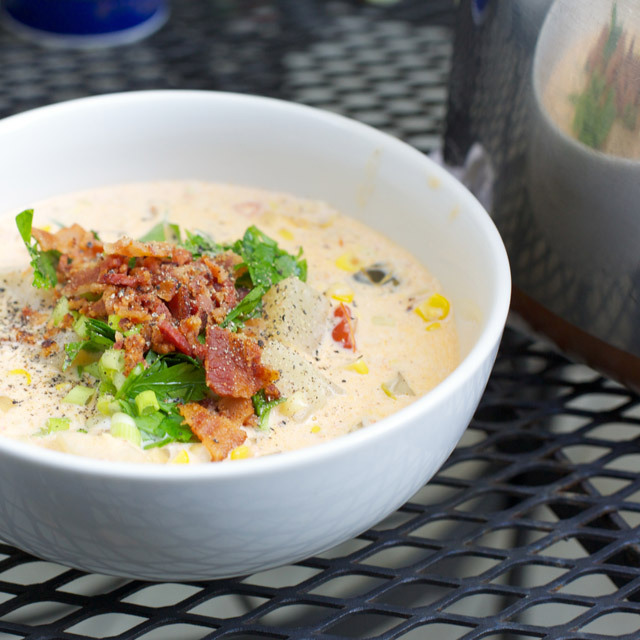 And is it me, or does summer corn’s creamy sweetness go just perfectly with bacon? Aaaaand more cream? 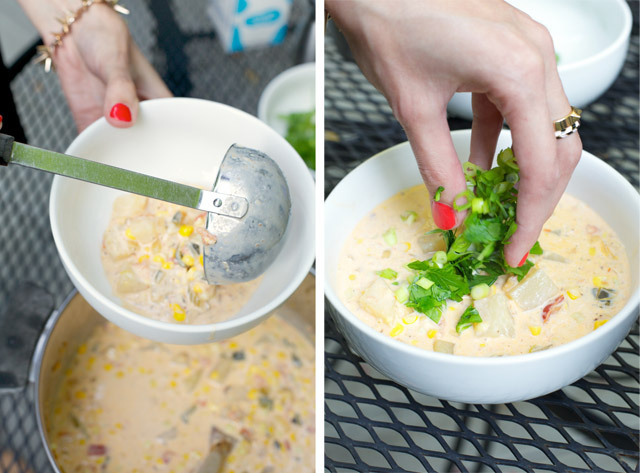 Chowder is the natural answer for combining all these fabulous flavors, but chowder? In the middle of the summer? 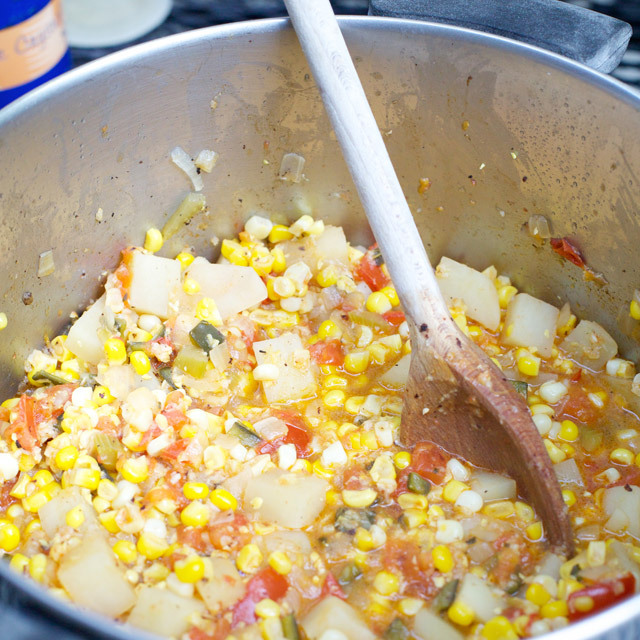 This recipe is the perfect chowder for summer. It’s rich and sweet without being unbearably heavy. That said, you should maybe save it for a day that dips below 90, like today if you’re in Maryland, as making it does require stove heat. I found the recipe on one of my favorite websites, Food 52. It’s brilliant because it’s dead simple, full of vegetables, the flavors are clear and harmonious (not to mention a leeettle spicy!) and it takes advantage of corn’s magic, sweet and starchy secret: milk. 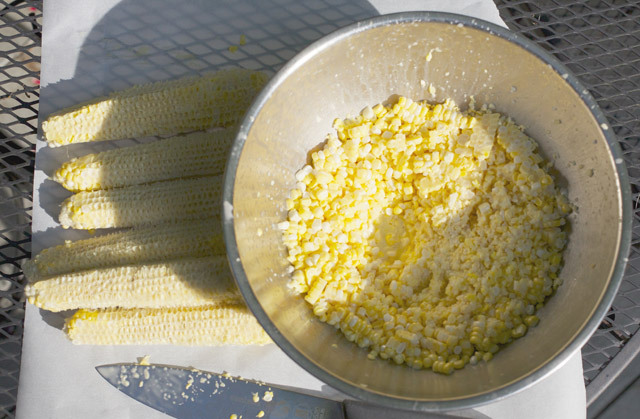 This is what “milked” corn looks like. 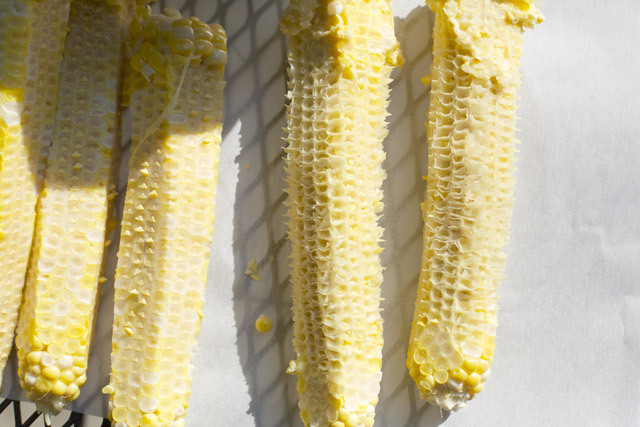 You “milk” corn after slicing the kernels from the cob by scraping the blunt edge of your knife down the side of each cut cob, thus freeing the pulp and juice from each little corn socket to fulfill it’s divine destiny. This is by far the messiest and most labor-intensive part of the recipe, but it’s also really the only messy and labor-intensive part of the recipe, so buck up. Everything else is stupid easy. Do the “milking” outside if you can, or lay out some newspaper before you begin. And don’t wear silk or cashmere, duh. Brown some bacon in a deep pot and reserve it for garnishing bowls later. 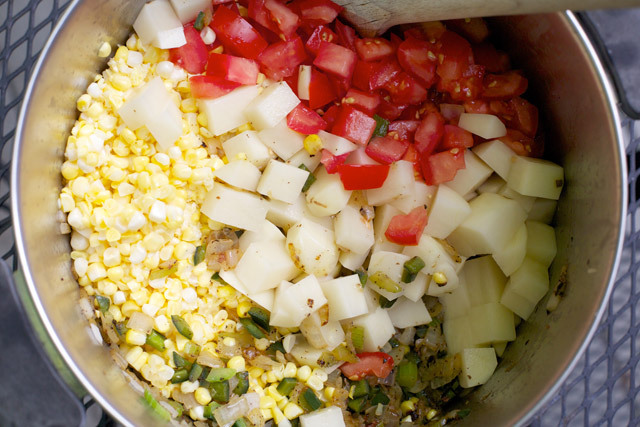 Saute onion, poblano, jalapeno, and celery in the drippings, then pile the rest of your chopped vegetables in the pot, including the corn and its “milk”. Cover the pot and set it on the stove for a little over a half hour. PS don’t even think about subbing canned tomatoes for fresh here. The tomatoes don’t have to be perfectly ripe, but they do have to be fresh, and juicy (so no Romas either). The first time I made this I was amazed by how much liquid came out of these vegetables. 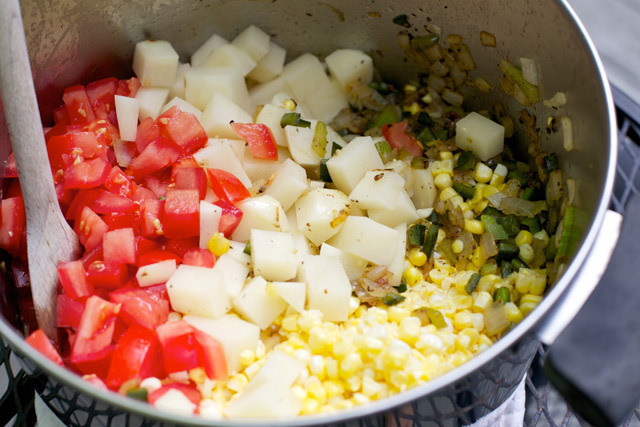 This is why fresh corn and fresh tomatoes are important – without them you won’t get all that broth. At this point there’s almost nothing left to do. Garnish with parsley (and scallions if you have any). Add bacon, a grind of black pepper if you like, and serve with crusty bread. 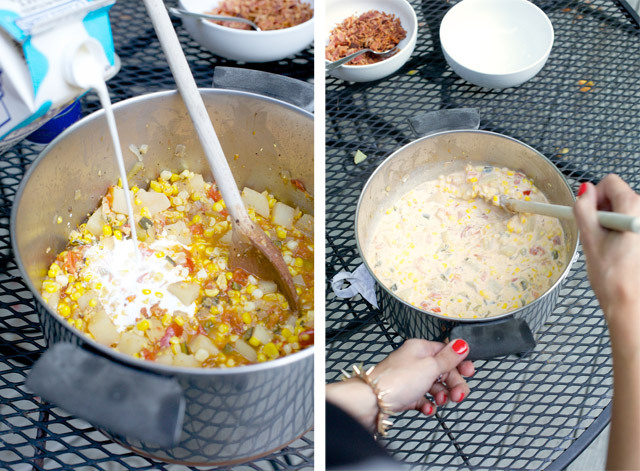 Read the entire recipe for brilliant, perfect summer corn chowder here. YOU’RE WELCOME. that looks SO GOOD. i'll have to try it, especially since afton loves chowder, too.